Photo by Jon Gardiner, courtesy of UNC-Chapel Hill. 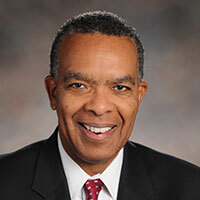 Aaron S. Williams, MBA, adjunct professor of health policy and management at the UNC Gillings School of Global Public Health and longtime executive at RTI International, has been awarded “emeritus” status by RTI, in recognition of his long and distinguished career in public service. Emeritus status is the highest recognition that RTI bestows on its leaders and is a reflection of the recipient’s superior achievements. A reception held July 25 at RTI’s offices in Washington, D.C., marked the career highlight for Williams, who served as the 18th director of the Peace Corps (2009-2012), worked for 12 years with RTI in international program management, policy reform, government relations and communications (2002-2009, 2012-2018), and served 22 years as a foreign services officer (1976-1998). Attending the reception and honoring Williams were colleagues, associates and friends, including members of Congress and representatives from the U.S. Agency for International Development (USAID), the Center for Strategic and International Studies (CSIS), the U.S. Global Leadership Coalition (USGLC), the Peace Corps and the International Youth Foundation. Williams’ long and distinguished career began when he was a Peace Corps volunteer in the Dominican Republic. Later at USAID, he rose to be a career minister in the Senior Foreign Service and was awarded the Distinguished Career Service Award and the Presidential Award for Distinguished Service. In 2009, President Barack Obama appointed Williams as director of the U.S. Peace Corps. Williams was confirmed by the United States Senate in August 2009 and served as director until September 2012. Under his leadership, the Peace Corps’ reach was expanded into Sierra Leone, Indonesia, Columbia, Tunisia and Nepal. He also led the White House delegations to the 2012 presidential inauguration in Guatemala and to the bicentennial celebration of the independence of Paraguay in 2011. Williams is the recipient of honorary doctoral degrees from American University, the Monterey Institute of International Studies, North Central College and St. Mary’s College. He received the UCLA medal for exceptionally distinguished academic and professional achievement. A member of the Council on Foreign Relations, Williams serves on the boards of directors of the Ron Brown Scholar Program, Seed Global Health and Child Fund International and the George Washington University – Elliott Scholl of International Affairs’ Advisory Board. He also has served on the boards of directors of the U.S. Global Leadership Campaign, CARE, the National Peace Corps Association, and the Institute for Sustainable Communities. Other career highlights include serving on the Obama-Biden transition team and being appointed by President Barack Obama as the U.S. alternative representative to the executive board of the United Nations Children’s Fund (UNICEF). Williams delivered the 2017 commencement address at the Gillings School.